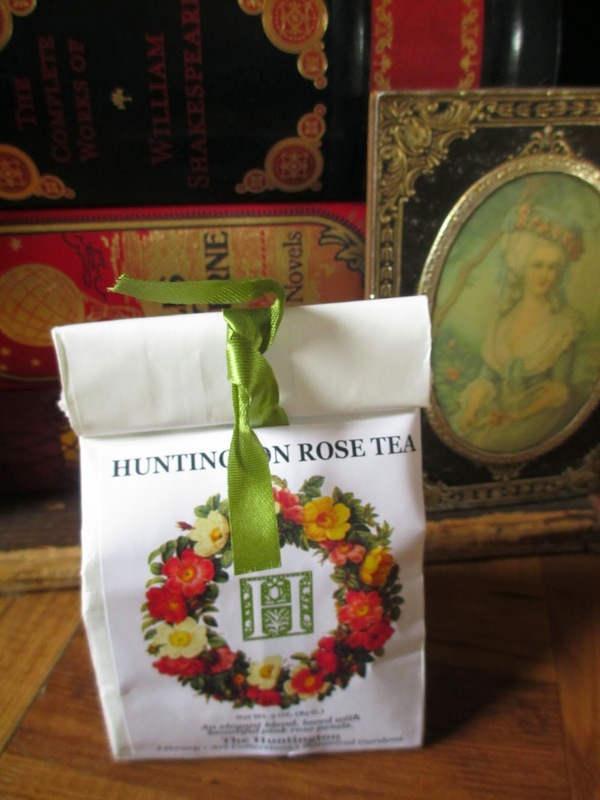 1) Huntington Rose Tea - When I was at the Huntington Library earlier this month, we had lunch in their tea room. I do love tea . . . and little sandwiches . . . and little desserts . . . and more tea. I tried out the rose tea because the tea room is in the rose garden and also because I knew that they sell the rose tea in the gift shop, so I wanted to test it out and see if I liked it. What makes this tea nice is that it has a black tea base. Sometimes floral teas are too lofty or too sweet, but the black tea base keeps this one grounded. It has the sweetness of roses but nothing more; it's a perfect summer tea (or maybe winter tea, too, since it's almost winter?). Absolutely elegant. 2) Green Glasses - I've had frameless glasses for, oh, three or four years now at least. Although I was used to them now, it's hard to find frameless glasses when thick plastic frames are so in style. So I figured I would go back to plastic, and if I went back to plastic, I might as well go all the way. I told the person helping me I was looking for black or brown frames but when she showed me a pair of green frames that were also available in black, I kind of liked the green. So if I ever liked to add green accents to my wardrobe, I really do now: I always feel like I need a second touch of green to help balance out the glasses. I also feel like I need bright color on my lips. 3) Mini Notebooks - These were from the Arboretum. They were so adorable that in my weakness for notebooks, I decided I didn't need to choose between designs: I could get them all. So I did. 4) Cameo Barrette - Another one of my random antique store finds, this barrette was ten dollars and probably not worth anything more than that. But I figure, a pretty barrette at Anthropologie will cost thirty dollars, so this was a nice little buy. Somehow with my new glasses, I often like to put up the top half of my hair, and that means that I can definitely use another barrette. 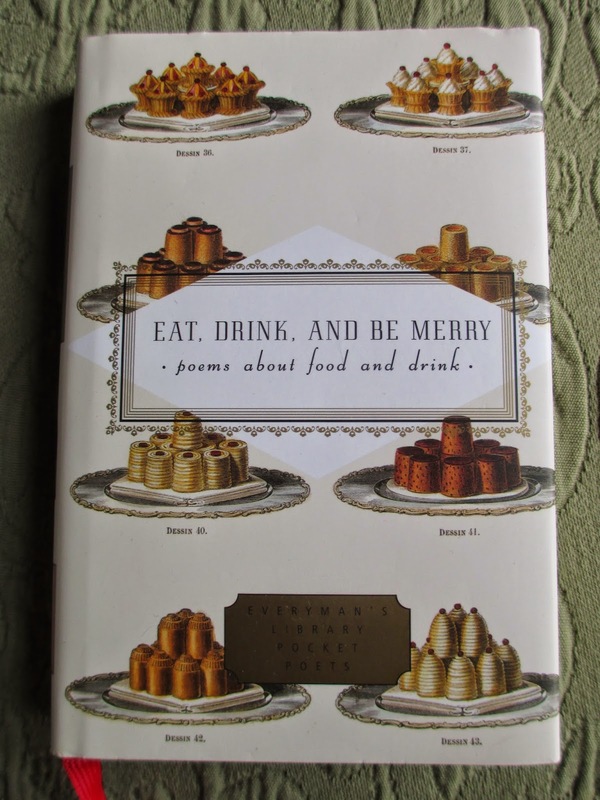 5) Food Poems Book - My second buy at the Huntington Library, this book just called to me. Everyone knows food writing these days can be incredibly lush, but what about poems about food from any era? Some of these are quite old, some are newer, some are short, some are longer, some are about simple foods, and some are about elaborate eatings. It's just a fun collection. 6) Yellow Sweater Tunic - I actually got this one last year at Anthropologie, but this time of year is the right weather for it. I don't know what it's called, so I call it a sweater tunic. It's a loose and chunky knit with short sleeves that comes down almost halfway to my knees (then again, it is a size small and I'm usually extra small, so maybe it's meant to come a little higher). I wear it with leggings and usually with long sleeves underneath. It's comfy for wearing at home (so much better than sweats--yuck) and also a pretty piece of clothing if you wear it out. 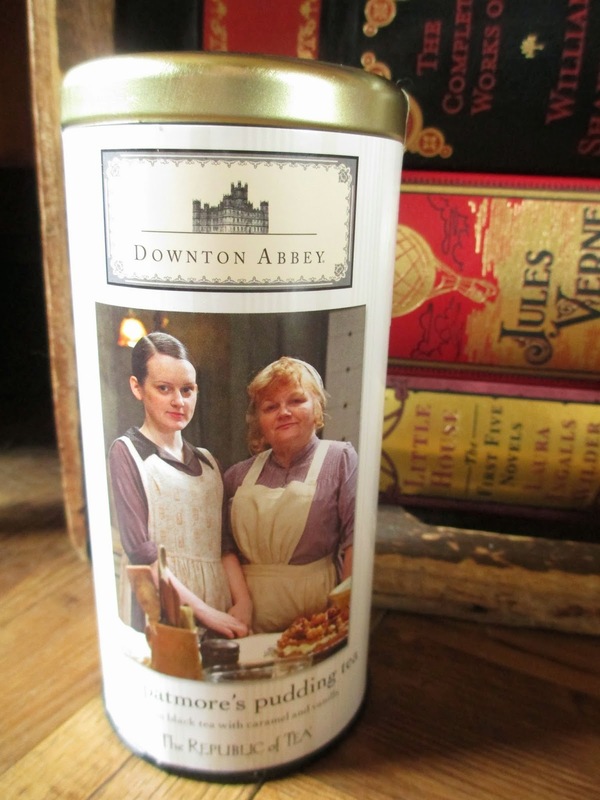 7) Mrs. Patmore's Pudding Tea - I know, I know, I say I don't like Downton Abbey all that much, yet I buy all their teas. But I love tea; you know this. They had three last year, and I think there are about four new ones this year. I love vanilla in tea, so this one was perfect for me. It also has caramel and blackberry leaves and carob, which gives it kind of an earthy sweetness. It's really delicious. 8) Scarves - I'm not a huge scarf person, but I do own a few scarves. Usually I have to remind myself to wear them. Usually I don't wear them on days when I'm just going to be at home. But guess what I just realized? Scarves keep you warmer. Even thin scarves. So if the weather is just close to being cold, I can wear a scarf instead of a sweater when I'm inside. Or a scarf instead of a thicker jacket. 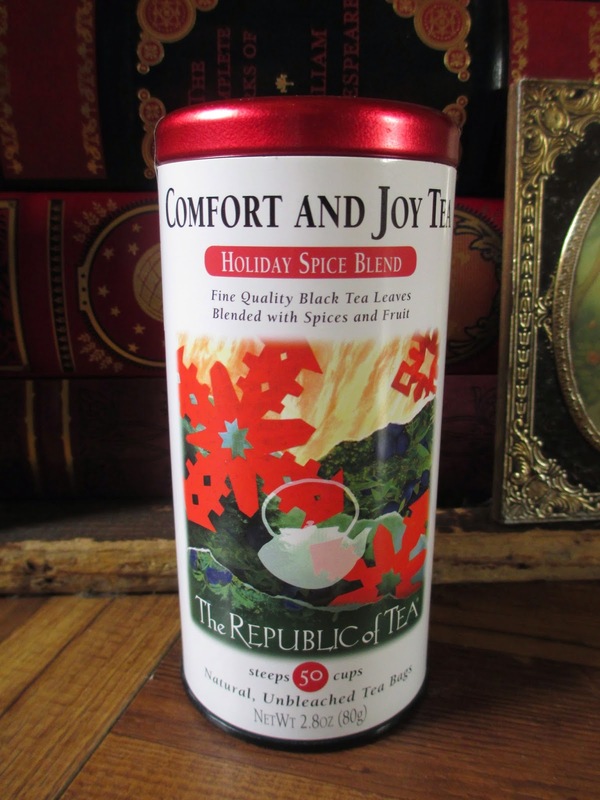 9) Holiday Spice Tea - Given that there are fifty tea bags in here, I'm going to be hard-pressed to finish it before Christmas. It's basically a black tea base with apples and cinnamon (there are also cloves and licorice. Sort of a hot apple cider version of tea. I like it, but sometimes all the spices end up tasting so sweet to me that I have to add in a little (almond) milk to take the edge off. 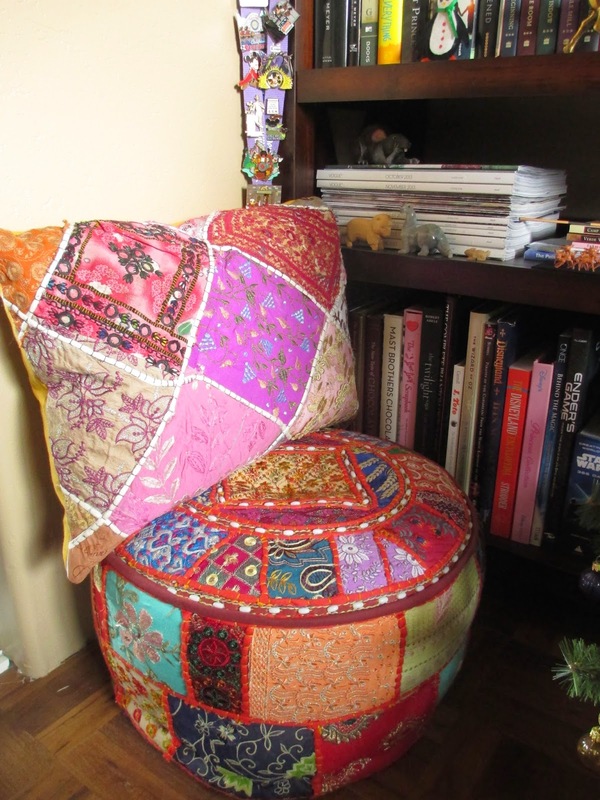 10) Quilted Pillow & Cushion - I had been eyeing these at World Market for a while, until I finally got them for setting in front of my little TV. The height's perfect. And when I'm not using them, they sit in front of my new bookcase.